When you give to others in the community, they give back. I think people are excited to help build a business, especially if you have helped theirs to grow. Jenna and I are so passionate about this career. I think people can sense our energy How does this relatively new team and commitment to them and are build their client base? The team’s drawn to us by our excitement,” sphere of influence includes per­ shares Liz. sonal friends, referrals from other business owners, and past clientele. 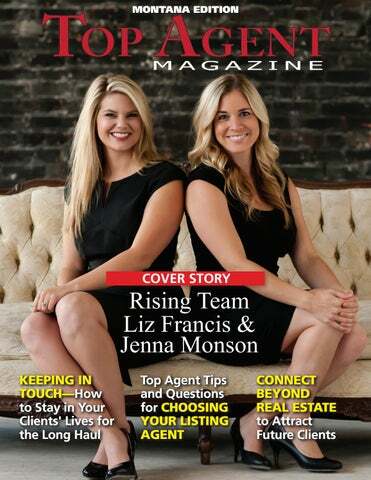 Liz and Jenna also focus on social “Our philosophy is quite simple. We media like Facebook, Twitter, and are in the business to help others. LinkedIn. Liz says many out of town with buyers in search of a second or vacation home as well as retirees. The two agents have also started to handle commercial, farm, and ranch properties, as well as investment properties. “Our philosophy is quite simple. We are in the business to help others. When you give to others in the community, they give back.” at a time. It’s important to surround yourself with people who support and motivate you, who drive you to be better than you were yesterday. Track the activity in your area; see Jenna advises, “Most new agents what’s new on the market, what has have a long list of goals. Take one step sold, and what’s pending. 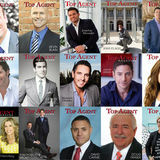 Make clients find the team through word of mouth and the agent has built relationships with local companies who refer relocating employees. Commissioned sales is one of the few places where you get paid exactly what you’re worth. One of my friends really hates that concept. “I could never live on that!” But loan officers have to do it all the time. The most successful people I know love being on commission! They love being able to give themselves a raise just by working harder. Most people need a little help learning how to budget, and how to put away money for taxes and infrequent but important expenses. and maybe a third will go directly to the government for taxes. You should be putting at least 10% away for savings and investment and 5% for surprises is not unrealistic. When I took over a large real estate office a few years ago I found out that one of my new REALTORS® was going through bankruptcy proceedings. I knew she a sold a lot of real estate and I couldn’t figure out how she got in that situation. One evening over coffee she told me about being a rookie with another company. She fell into a land deal and made the single largest sale her company had ever made. Commissioned sales is one of the few places where you get paid exactly what you’re worth. head. The problem? She spent it all! She started borrowing trying to pay her taxes. She was so stressed out over the tax situation that she didn’t sell any more real estate for the next year. REALTORS® or other commissioned sales people. A little planning in advance for regular and predictable expenses and a slush fund for surprises and you’ll be covered!